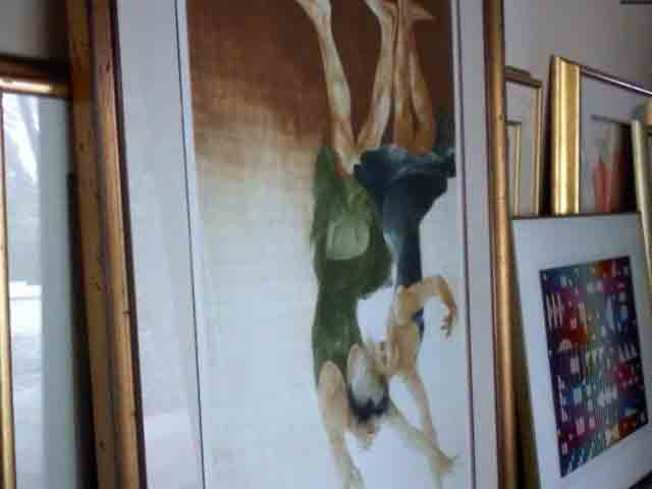 Amadio and Dr. Kennaugh are offering a $1 million reward for the return of the stolen artwork. "The Thomas Crown Affair" is quickly turning into "The Vanishing." Ten days after two businessmen reported 14 paintings by the likes of Van Gogh, Jackson Pollack, Rembrandt and Renoir stolen from their Pebble Beach house, authorities said there is no evidence that the art collection ever existed, and the victims are now suspects. Monterey County Sheriff's Commander Mike Richards said Tuesday that the owners of the art collection did not provide any documentations showing that the paintings existed, or information on how they were acquired. There was no evidence of a break-in at the Pebble Beach house. Police are now focusing their investigation on the owners, Angelo Amadio and Ralph Kennaugh, business partners who recently moved to Pebble Beach from Massachussettes. "They are suspects," Richards said. "We feel manipulated. The bottom line is, this is a simple investigation. It can be made a lot easier with the cooperation of the victims. We've been blocked the entire way on this thing. "We're still investigating this on its face value as it was represented initially, but while doing so, we're shifting the focus of the investigation to the alleged victims, because of inconsistent statements and other details to address the veracity of what they're saying." The sheriff's have also asked Amadio and Kennaugh to take lie detectors tests, which they have declined. Earlier in the day, a lawyer representing Amadio and Kennaugh issued a press release identifying a local insurance broker who saw the collection. The broker told NBC Bay Area he had in fact seen "many of the pieces." Richards dismissed his impact on the case. "We don't care if he's seen them," Richards said. "We want documentation. The gardner could tell us he's seen these pictures." The couple reported the theft on Sept. 25 and initially said the paintings were valued at $27 million dollars. They later revised the collection's estimated value to $80 million -- which would make this one of the biggest thefts in fine art history. But Amadio and Kennaugh insist the collection was not insured -- which would seem to eliminate their motie. Richards said police have several theories on motive. "The most common motive is money," he said. Amadio and Kennaugh denied that the theft is a hoax, and have accused the sheriff's department of botching the investigation.